Building on the successes of the Health Sector Reform Programme (2003-07), the National Strategic Health Development Plan (NSHDP), which was launched in 2010, has given the health sector a more strategic outlook. The Plan has helped to institutionalise a focus on results, rather than the traditional inputs-based planning and programming. With its approval as the compass for all health development-related initiatives as well as the health component of the National Development Plan – the Vision 20:2020, the NSHDP has helped to focus the work of all stakeholders in the health system around a common policy, with common goals, objectives and shared strategies. Some of the key issues that our reform processes and policies had tried to address included low coverage of essential healthcare services for mothers and children, limited access to skilled healthcare personnel, especially for maternal and child health, and dwindling confidence in our tertiary healthcare system due to obsolete equipment and dilapidated structures. In order to improve the proportion of mothers and children who have access to essential healthcare services, the Nigerian Government launched the Saving One Million Lives Initiative (SOML) in 2012. The SOML is a results-based sector-wide approach to improving health outcomes especially among the most vulnerable groups in our society today – mothers, children and the poor. It is envisaged that through the implementation of this initiative, we will be able to save at least one million lives from avoidable deaths by the end of the year 2015. Following the removal of oil subsidy in early 2012, the savings from this initiative were ploughed back to help strengthen some priority sectors of the economy under the Subsidy Reinvestment and Empowerment Project (SuRE-P). The health sector was selected as one of these priority sectors, with a focus on strengthening systems necessary to improve access to essential healthcare services for mothers, children and the poor. An important factor attributed to the high maternal mortality rate in the country is the limited access that pregnant women have to skilled healthcare during pregnancy and birth. To improve this situation, as well as access to these health professionals for child health issues, the Midwives Services Scheme (MSS) was introduced. This project has received recognition internationally. As a result of MSS, Nigeria was awarded first prize in governmental strategic innovation by the Commonwealth Association of Public Administrators in 2012, coming ahead of around 200 participating countries. In order to further institutionalise and provide a legal basis for the sharing of responsibilities between Federal and State Ministries of Health, as well as sustained collaboration and partnership between the Federal and State health institutions, we are pursuing the passage of a National Health Act. The bill for the Act has already passed yet another second round reading in the National Assembly and we envisage it will become an act before the end of 2013. The Government remains steadfast in its belief that the Millennium Development Goals (MDGs) are feasible and can be achieved by 2015; the progress we are making with MDG 4 (reducing child mortality) clearly demonstrates this. The Health Sector’s recent commitment to applying the MDG Acceleration Framework (MAF) approach as one of the key strategies to realise the accelerated achievement of the MDGs by 2015 beginning with MDG5 as a pilot following a presidential directive is further evidence of our unwavering dedication to the MDGs. Indeed real gains have been made in terms of infrastructure, service delivery, human resource for health and access to healthcare for the most vulnerable. During the meeting of the WHO African Regional Office, in Luanda, Angola, November 2012, I shared the concept of the SOML and the efforts of the Nigerian government towards achieving the targets of the UN Commission on Life Saving Commodities. The overwhelming support and commitment by the member states present during the presentation revealed one thing – that member states are committed to the improvement of the health status of their citizens; they are happy to learn and take necessary steps to implement best practices in this regard. I see the Commonwealth Health Online initiative as an important platform for knowledge, experience sharing and collaboration and I congratulate the Commonwealth Secretariat for this valuable initiative. 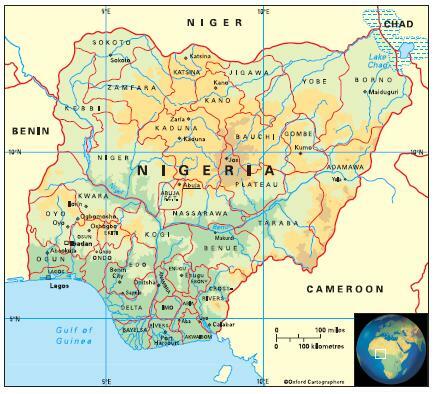 The Federal Republic of Nigeria lies on the Gulf of Guinea and has borders with Benin (west), Niger (north), Chad (north-east across Lake Chad) and Cameroon (east). It comprises the Abuja Federal Capital Territory and 36 states. Tropical; hot and humid on the coast, with greater extremes of temperature inland and cold nights in the north during December and January. The rainy season is generally March-November in the south and May-September in the north. In the dry season the harmattan wind blows from the Sahara. Environment: The most significant environmental issues are rapid deforestation, soil degradation and desertification. 168,834,000 (2012); 50 per cent of people live in urban areas and 15 per cent in urban agglomerations of more than a million people. The population growth rate stood at 2.6 per cent p.a. between the years of 1990 and 2012. In 2012 the birth rate was 42 per 1,000 people (47 in 1970) and life expectancy was 52 years (40 in 1970). Nigeria is one of the most ethnically diverse countries. There are some 250 ethnic groups, with the Hausa-Fulani, Yoruba and Igbo making up 70 per cent. Nigeria is classified as a lower-middle-income economy by the World Bank.